Malaria is a life-threatening disease caused by parasites that are transmitted to people through the bites of infected female mosquitoes. It still causes over 400 000 deaths globally and puts at risk 3.2 billion people – almost half of the world's population. World Malaria Day is celebrated on 25 April each year around the world. Its goal is to raise awareness about the burden of malaria worldwide, and malaria prevention and control efforts. This year's theme "End malaria for good" reflects the vision of a malaria-free world set out in the "Global technical strategy for malaria 2016–2030". 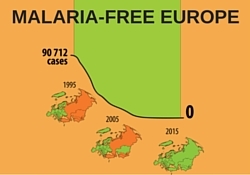 Ahead of World Malaria Day, the WHO European Region announced hitting its 2015 target to interrupt indigenous malaria transmission.